Designers across the nation agree; the role that lighting plays in the home has dramatically evolved. With new fixture designs that incorporate unexpected pops of color, striking structural forms and luxurious materials, statement lighting has moved from a behind-the-scenes prop to, in many cases, the home’s main act. We gathered additional insight from our friends at Progress Lighting on how to create memorable spaces with lighting. Here are four ways you can make your rooms more beautiful and distinctive with statement lighting. Whether it’s a crystal chandelier in the bathroom, a bold pendant in the home office or a pair of whimsical mini-pendants above a bedside table – using unexpected lighting in different areas of the home is an easy way to make a fashion statement. Not only can the type of fixture create a distinctive style accent, but focusing on areas of the home that are typically void of decorative fixtures altogether can be a distinguishing factor. Who’s to say the mudroom can’t be outfitted with a beautiful chandelier? 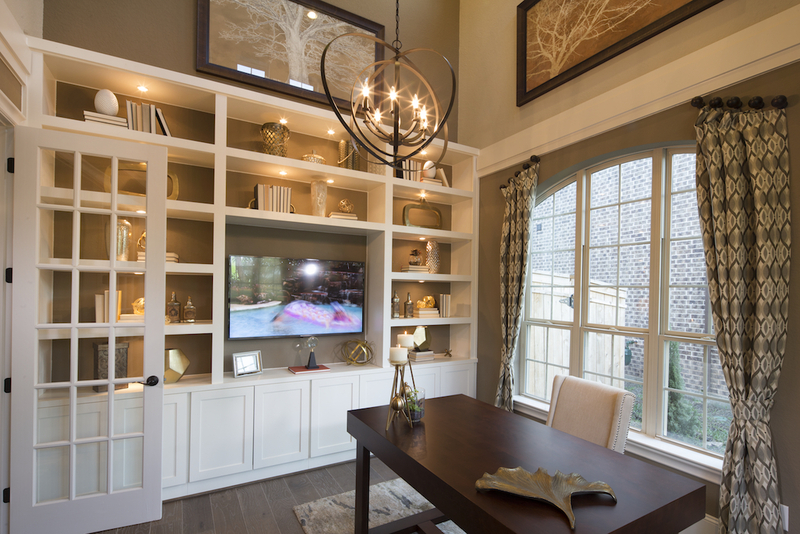 The Equinox chandelier provides an unexpected style element that takes this home office to a whole new level of design. The trend to group fixtures in clusters of two or more is a sure way to catch the attention of friends and family. Through light, contrast, and reflection, lighting provides a style element that cannot be achieved with other accessories. When installed in groups, the effect is multiplied! Natural areas for grouping pendants or chandeliers include a two-story foyer, above a breakfast nook, or over a dining room table. 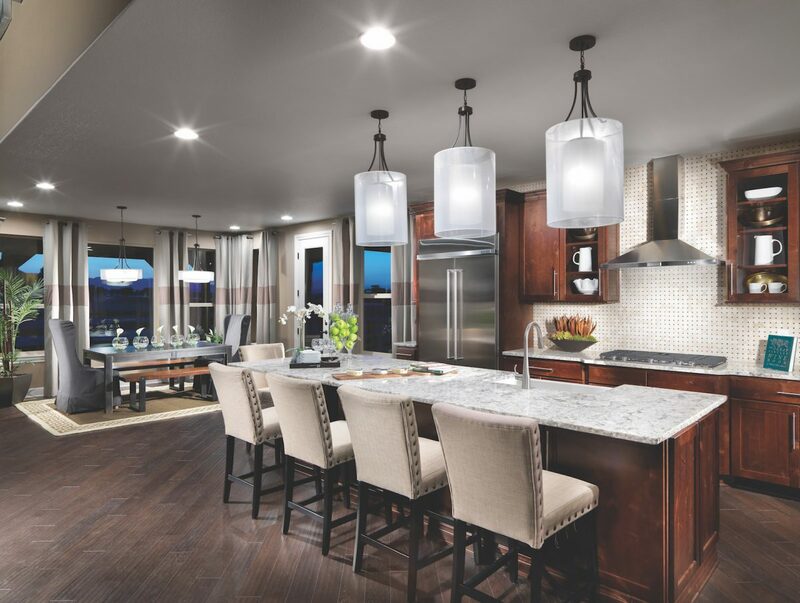 The unique form and layered glass of the Caress pendants add to an impressive kitchen scene. The water glass element adds rich texture and playful reflections. As David Peek put it – lighting can be (very literally) a work of art. Fixtures with craftsman elements provoke interest and intrigue in the home. Progress Lighting offers many fixtures with handcrafted features such as hand-painted finishes, blown glass, and hand-bent forms. Fixtures that are made by hand suggest a one-of-a-kind appeal for a one-of-a-kind home. 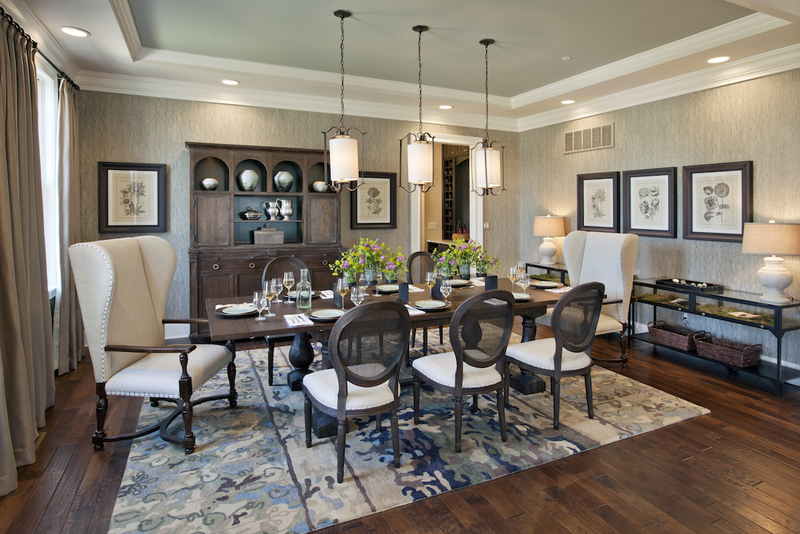 Switch out your traditional chandelier with a new row of pendants to light your dining room table setting. Update your existing fixtures with small changes to bring a fresh vibe to a room. Crown your favorite fixture with off-white shades to bring in an elegant appeal as you prepare for holiday entertaining. Or, install vintage Edison bulbs in your kitchen pendants to create a warm, inviting glow and captivating design element. It’s the little things that make the difference. 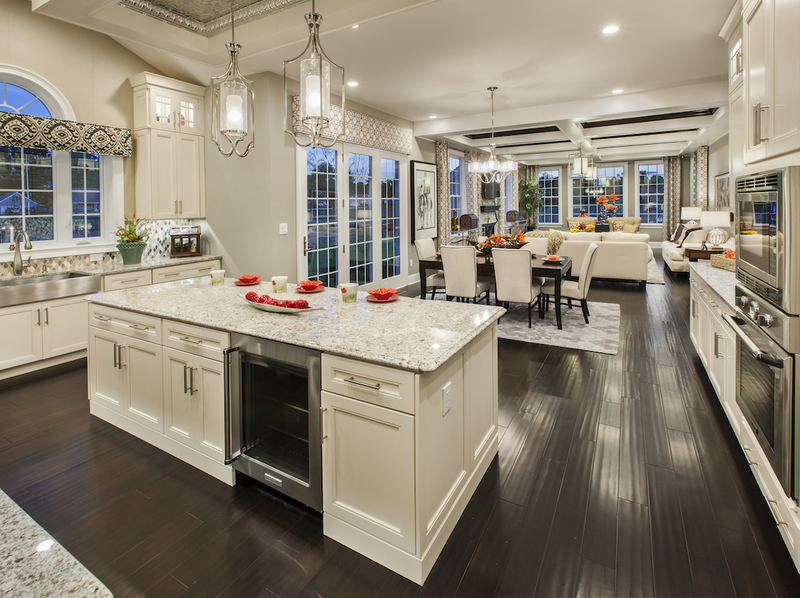 For more design tips and lighting ideas, visit Toll Brothers’ and Progress Lighting’s shared board on Pinterest. Toll Brothers’ partner Progress Lighting contributed to this story.